Need advice about a specific GMC Sierra 1500 problem? See TSBs and recalls for the 2015 GMC Sierra 1500. 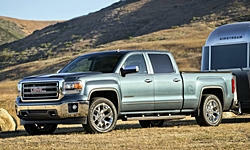 See repairs for all GMC Sierra 1500 model years. 4300 mi vehicle locked in 4WD, would not shift out. Software problem and easily fixed. 5000 mi A/C compressor was replaced. 3700 mi Nothing was done. I was told it had no problems. I have had 25 cars in my life and NONE with A/C that won't cool properly. I have read blogs that A/C is a frequent problem with GM trucks. I will try to trade this December. 35000 mi The power steering hydraulics is not working correctly, but no leak was found. They didn't replace anything, just top the fluids, which I'm curious since they found no leak. I am scheduled to take it back for repairs. 12700 mi Updated TCM with revised programming. 6000 mi Very Rough Shifting - especially low-speed downshifts. Software was re-programmed per TSB. Hood misaligned at factory. Hood realigned at dealership. Intellilink system failed. No OnStar and no Remote via Internet. Continued rough drivetrain operation. Transfer case re-programmed per TSB. 11000 mi Engine exhibited surging from idle (approx. 600 RPM) to 1,350 RPM whiles stopped with no throttle application and also when using very light throttle. Nav/Radio/Intellink system froze while driving. Stopped and turned off vehicle. System would not reboot and radio would not shut off-even after turning off ignition and restart. System operated normally next day. Dealer could not replicate. Transmission exhibited very rough, clunky, and sometimes violent shifting at lower speeds and light throttle applications on an intermittent basis. Dealer performed transmission reprogramming per TSB. 13400 mi The radio, media and navigation system makes changes on there own could not be replicated while at the dealer. They did a computer update. 25000 mi Driver alert system malfunction warning light. Dealer attempted to duplicate but was unable. Problem persists. Driver's seat bracket loose causing the seat to move slightly (click) during turns, acceleration, braking, etc. Dealer claimed no knowledge of TSB and could not identify problem. US $75 Recharged AC unit -- appears that problem may require dealer fix. US $750 Replace AC hoses and compressor. Recharge AC. 17200 mi OnStar system failure (red light). No GPS or Compass available. External antenna was replaced. See our lemon odds and nada odds page to see vehicles with no repairs or vehicles with more than three repairs. To see how frequently 2015 GMC Sierra 1500 problems occur, check out our car reliability stats.